All expedited services are backed by our complete customer-satisfaction guarantee. If we don't deliver on time, we make it right. Please note: Due to available capacity within the airfreight industry, Averitt cannot guarantee delivery dates/times if any portion of your expedited shipment moves via air. In the event that an expedited shipment that moves via air is delayed, we will contact the responsible party and work to develop the best solution available. It's Tuesday afternoon. You need three skids at 2,400 lbs. in Chicago from Savannah by Wednesday at 5 p.m. Need immediate assistance? Contact our Expedited team by calling toll-free 1-800-283-1995 or email expquote@averittexpress.com. Or request a quote online with response within 30 minutes. Our team of specialists is available 24 hours a day, seven days a week, to take your call. The fully staffed communications hub controls and monitors all expedited traffic, allowing for instant online tracking whenever you need it. 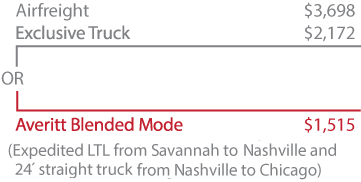 Let Averitt show you how simple time-critical shipments can be.